Student Government candidates discussed issues ranging from a trauma center to the quality of the dining hall food in a debate yesterday in Kent Hall. Voting begins Wednesday at 9 a.m and ends on Friday at 5 p.m. Slate positions of president, vice president for administration, and vice president for student affairs are up for grabs. Two slates are running: United Progress (UP) and Delta Upsilon’s Moose Party. UP candidates are second-year Tyler Kissinger, third-year Arlin Hill, and third-year Aseal Tineh, respectively. Moose Party candidates are second-year Kent Bischoff, second-year Sam Hopkins, and first-year Owen Grimm. The Moose Party is a satirical campaign put up by Delta Upsilon every year. Kissinger spoke of his support of the U-Pass program, which would cover all CTA transportation for a fixed fee. The Moose Party stood in opposition to U-Pass, saying that “the CTA is dangerous.” Hill spoke of launching a campus climate survey to examine how inclusive the University campus is, and said that UP’s core values consist of “promoting inclusiveness and diversity on our campus.” Tineh spoke of UP’s goal of increasing accessibility of campus facilities. Next to debate were the candidates for the undergraduate liaison to the Board of Trustees: first-year Leeho Lim, and write-in candidates first-year Alex DiLalla and third-year Clemente Dadoo. The three expressed different positions on voting rights for the position: DiLalla supported the Duke model that would create three undergraduate liaison positions with staggered terms and elections taking place annually to replace one liaison every year. Liaisons could only vote in the last two years of their term. In the Duke model students have to be rising fourth years to run, but DiLalla said he would be open to modifying that system at UChicago. Lim, meanwhile, expressed support for full voting rights for the graduate liaison but not the undergraduate liaison. Dadoo said that he did not think that liaisons should be able to vote on the Board. “One person’s unique opinion does not effectively represent the student body as a whole,” he said. Lim also said that he would work to increase unity between administration and students and take measures to address the decentralization of undergraduate and graduate students, which in conjunction with voting votes would give voice to issues on campus including establishing a trauma center on the South Side. Dadoo spoke of further developing pre-professional academic programs like engineering and expanding the #171 bus route during rush hour. DiLalla expressed support for University divestment from fossil fuel companies and increased UCPD transparency. Regarding the accessibility of the board, Lim offered the idea of inviting students to formal panels and Fireside Chats with the trustees. DiLalla added the idea of having larger town hall–type meetings with students and the Board both involved. 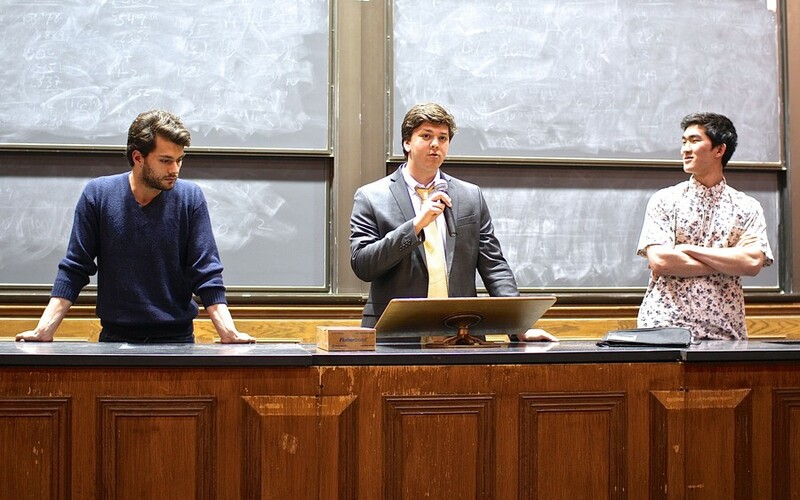 The final debate was among the three write-in candidates for community and government liaison: first-year Kenzo Esquivel, second-year Brendan McGuire, and first-year Lizzy Noble. Noble said that it was “ridiculous” that the U-Pass system is not implemented already, and also offered the idea of holding quarterly meetings with community business owners. McGuire hopes to increase the number of student service days. “[My] best experiences at the University of Chicago [have] been through community service,” he said. Esquivel also highlighted community service, and said that the University and the community can work well together. “By engaging students in community service, we can really make a difference in the South Side community,” he said.